he late Drubwang Adzin Rimpoche, was the elder brother of H.E. Namkha Drimed Rabjam Rinpoche. 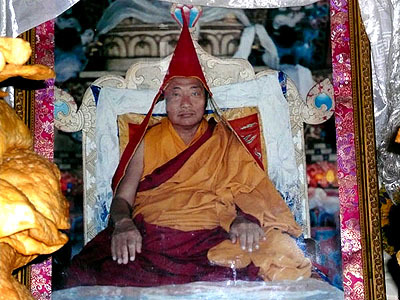 Drubwang Adzin Rinpoche, also known as Kyabje Ritrul Rigdzin Chogyal was the 4th Ripa Chogtrul. He was born in the Water-Hen year, 1933, with a tangle of long hair on his head, as the son of Ripa Dungdzin Jangchub Shenpen and Mayum Palden Tsomo. In connection with his recognition by Dzongsar Kyentse Chokyi Lodro as the reincarnation of the 3rd Ripa Tulku, Pema Dondrub Gyaltsen, he was given the name Ritrual Rigdzin Chogyal. From Khewang Lama Tsethar, a student of Dzogchen Khenpo Shenga, he studied the many common Buddist sciences as well as the practices of ritual dance, iconometrics, and liturgical chanting belonging to Ripa tradition. From Ripa Jigme Tsewang Chokdrub and the 6th Taksham, Karma Sangak Tendzin Dorje, he received the entirety of the Ripa lineages ripening initiations, liberating instructions, and pith advice. Moreover, from Nyagrong Tertön Jigme Chojung Lingpa, Dudjom Jigtrel Yeshe Dorje, Dilgo Kyentse Rinpoche, Shechen Kongtrul Pema Drime, Drubwang Shakya Shri’s son Dungsey Pakchok Dorje, Apo Rinpoche Ngawang Yeshe Rangdrol, and others, he received every type of ripening and liberating teaching without regard to sectarian distinctions between New or Old Translations Schools, such as the Precious Treasury of Terma (Rinchen Terdzo), the Heart-essence of the Great Expanse (Longchen Nyingthig), the Nyingma Transmitted Word Collection (Nyingma Kama), the Seven Treasuries (Dzod Dun), the Collected Works of Drubwang Shakya Shri, along with all of the associated explanatory instructions for each. Then for many years he resided in strict practice retreat. When the times were about to change, with his younger brother Namkha Drimed Rabjam Rinpoche, his immediate family circle, and several attendants and monks from his communitiy, Rigdzin Chogyal Rinpoche eventually made his way to the settlement of Orissa by way of Pemako. 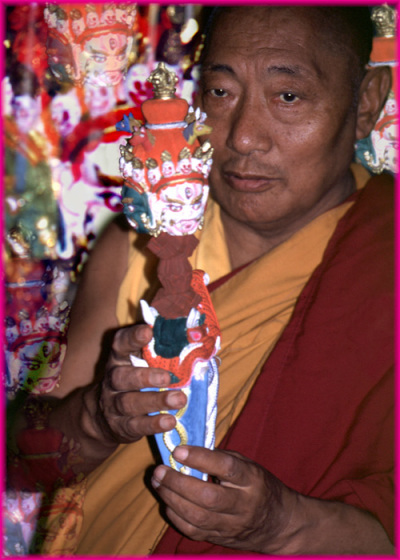 Then, with Namkha Rinpoche, he performed an ongoing number of projects. Amoung other activities, he mass printed the only manuscript in India of the Taksham Gathering of the Intention of all Yidams (Yidam Gongdu), having borrowed it from Kyabje Chatral Rinpoche; he oversaw construction of Rigon Thubtan Mindroling Monastery, and instituted a community of ordained monks there. Thus he acted as a lifeline to ensure that the continuity of the doctrine would not decline while in exile. During annual fasting retreats, recitations sessions, great accomplishments rites, and Lama Dance ceremonies Rigdzin Chogyal Rinpoche gave advice on how to be virtuous in this and future lives and gave profound instructions on the path to all the laity and clergy present. The power of his compassion was immense in the rites and supportive teachings for the well-being of the deceased and living, as well as for the infirmed. Out of his great love, he especially cared for the underprivileged, the elderly, and the incurably ill. For these and other reasons, the entire population of the settlement had uncontrived devotion and respect for him. For Three years, beginning in 1973, Rigdzin Chogyal Rinpoche accepted the responsibility of Nyingma representative for the 5th Tibetan People’s Assembly. Not only did he share a warm and close relationship with H.H. the Dalai Lama, but His Holiness also upheld Rigdzin Chogyal Rinpoche as the epitome of Great Perfection Yoga and repeatedly tossed flowers of praise upon him. Rigdzin Chogyal Rinpoche’s students invited him to India, Bhutan, Switzerland, and other countries, but aside from temporarily fulfilling each of their expectations; he continuously dwelled in a state of one pointed practice, as though he were spending his life in retreat. Without attachment, hope, or fear for anything whatsoever, with few needs and in an open state of carefree ease; he actualized in the intent of undifferentiated self-appearance, the Great Perfection. He thus lived as an actual great renunciate. Finally, on the 6th of June 1992, the 29th day of the Saka month in the Tibetan Fire-Ox year, which was the day of Jamgon Mipham Rinpoche’s death anniversary, Rigdzin Chogyal Rinpoche demonstrated the manner in which enlightened intent comes to rest in the expanse of reality. He remained in an upright meditation posture for three days. Then, when his family and disciples, led by Drubwang Chagme Rinpoche and Namkha Rinpoche, were cremating his precious remains, there was an infinite appearance of signs that he was perfectly enlightened on the primordial level, such as rainbows dawning in the direction of his reliquary, the appearance of relics of five-colors, and so forth, which were verified as visual objects for all. We are now supplicating from our hearts that a display of his miraculous emanation will once again swiftly appear.